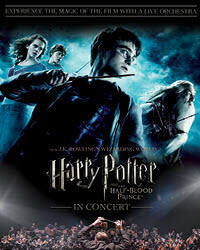 Introducing Harry Potter and the Half-Blood Prince™ in Concert to the Harry Potter™ Film Concert Series. Audiences can relive the magic of Harry's sixth year at Hogwarts™ School of Witchcraft and Wizardry, set to the music of a live symphony orchestra. Watch Harry become a wiz at potions, win Felix Felicis, and uncover the meaning of Horcruxes! Concert performance includes FULL SCREENING OF THE FEATURE FILM! For more information on the Harry Potter™ Film Concert Series, please visit www.harrypotterinconcert.com.